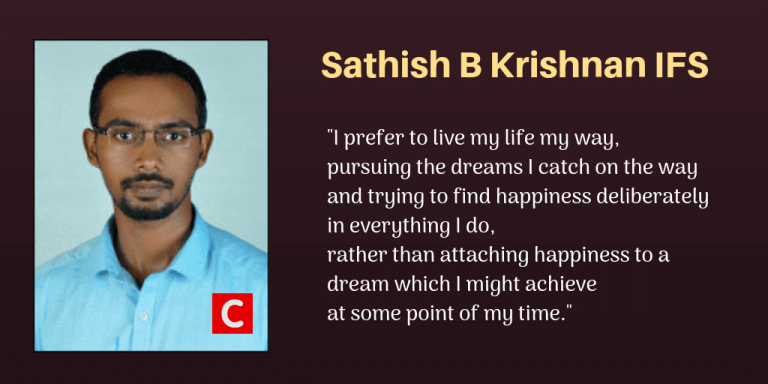 Sathish B Krishnan (UPSC CSE 2017 Rank 125) Toppers' Interview - "Clearing UPSC is a Milestone, But Life is Bigger than UPSC; Never Forget That!" 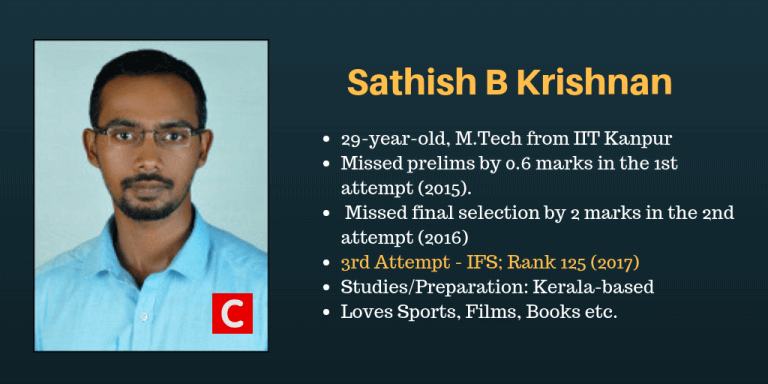 “Be like water”, says, Sathish B Krishnan Rank 125 in UPSC Civil Services Exam 2017. Sathish believes that aspirants should not confine himself/herself to any particular style/method alone. He also warns against sacrificing aspirants’ happiness and pleasures completely for a single goal like clearing UPSC CSE. Sathish was totally different from his fellow aspirants in his methods of preparation. However, his unique style proved extremely beneficial, as he emerged as a UPSC Topper this year. Let’s hear more from him. Probably like every other Keralite, the scintillating movie dialogues did instil momentary likes towards the ‘powers’ of Dist. Collector, Police Commissioner etc. But Kerala and particularly the Malabar region had little exposure to civil service and hence the dream did not find any way forward. However, after joining the corporate, the dream started coming back every now and then, thanks to the defence deals largely mediated by the IFS and IDS guys. Finally, I made up my mind and got the courage to resign after having a few discussions with my family as well. This is my 3rd attempt and the 2nd after resigning from the job. So, for a person like me who has been living in a state of stress and frustration (though managed and under control), the feeling is more like a relief rather than happiness. Particularly so because I still remember the day result came last year, finally landing me in deep despair. I am basically from Kannur district in Kerala, where I did my education till 12th in PES Vidyalaya near Payyannur. Then I moved to Thiruvananthapuram to do my graduation in mechanical engineering. Later I did my M.Tech from IIT Kanpur. After my post-grad, I was associated with L&T defence & aerospace dept for a short while of about 2 years. In December 2015, I resigned from the post of Sr. Engineer and moved to Thiruvananthapuram where I pursued my Civil Service dreams. Life, for me, is not a computer program of ‘if, than and elseif’. I prefer to live my life my way, pursuing the dreams I catch on the way and trying to find happiness deliberately in everything I do, rather than attaching happiness to a dream which I might achieve at some point of my time. My post-grad times and corporate experience did help me in molding such a thought process. The stress situation I had to go through during my M.Tech period was indeed manifold than my UPSC preparation times. So I used to think, “if I can get through that alive and happy, why not this…??”. In my opinion, civil service should not be compared with most other private sector jobs. After all, this is not a job based on any professional course. It is more like a realization when you understand the society better. One should try to compare and match the demand of the profession with his/her own skill set and aptitude and then reach a matured conclusion, rather than jumping into civil service preparation at 21 or even lesser an age…!!! For me, I was able to enjoy the entire process of preparation (despite the stress and frustration at times) and that, I guess, is the secret behind my success as well. After all, how can u do something good if you are not enjoying it…?? I did not have any separate strategy for prelims, mains and interview. It was all the same, with slight modifications. Primarily, I keep myself open to all kind of sources of information – people I meet, places I travel, random books (including novels, stories etc) I read, movies I watch, music I hear etc are all my study materials and my best teachers. This indirectly helps to broaden my perspective and I guess paid off well in my mains and interview. And for prelims, I had a set of fixed resources, the ones I have relied for the last 3 years. I keep this source limited and try to revise them to help my short term memory (because I acknowledge that it is my weak spot). 3 years and 3 attempts it has been for me to realize this goal. However, I try never to micromanage my time. There were days I studied nothing, but there were also days when I efficiently spent 6-7 hours as well. But on top of that, I make sure to engage myself in all kinds of cultural and sporting events happening in and around Thiruvananthapuram, which was an important part of my life as well as my preparation. Even during the days before the examination, I used to have my badminton sessions, which I felt was very important. Nothing specific. I go with the flow and do what I feel is most appropriate at that point in time. When I feel lazy, I drag myself across and get me to some reading spaces/study groups. But otherwise, I sit and do things on my own. So ultimately it is about realizing and acknowledging the then state of mind and doing accordingly. I joined Kerala State Civil Service Academy in 2016 January and attended a few months’ classes there. I took my prelims mock test also there. In 2017, I gave no prelims mock test. In mains preparation, I was associated with Pala academy Thiruvananthapuram campus, where I was also a faculty. Mentoring from Arun sir and Remya ma’am was also of great help. With respect to my optional preparation (Malayalam Literature), in 2017 I gave my mock tests mentored by Arunsir (different from the Arun sir mentioned before). Nothing specific as such, since I never had a set pattern or specific sites for reference. But I guess that the sites like ClearIAS, pmfias etc could be handy for factual information and last minute revision materials. From my limited acquaintance with the website, I have always felt it handy to use and easy to move along. The materials with respect to history, geography etc are well organized such that it could even help self-study to a large extent. I have gone through the study material compilations provided in the ClearIAS website and felt it quite useful, particularly for my final revisions. FB, Whatsapp etc continued to be a part of my life during the preparation period as well. 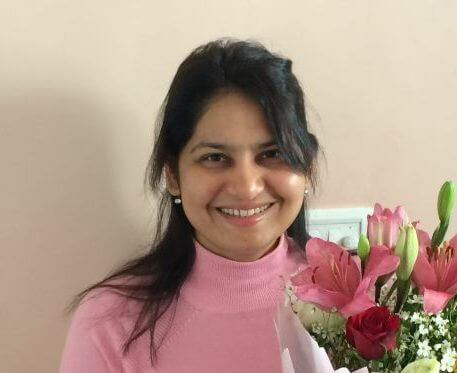 However, I seldom used them deliberately for any preparation, though my discussions and debates there might have indirectly helped me in mains and interview preparations. Absolutely no magazines, but have been quite regular with ‘The Hindu’. But again, newspaper for me is not a source of current affairs information, but it serves in building up my perspective. Also, no specific time devoted to them. A mix of both as and when comfortable. I believe that one should not confine himself/herself to any particular style/method alone. Be like water…. No specific pattern per say. Be healthy…be happy…be comfortable…reinforce with positive feedback and do course corrections as and when required. That is all…!!! I kept myself engaged as much as possible, thus leaving no room for idleness. This helped me keep myself away from negative thoughts, depression etc. It also kept me healthy and broadened my thought spectrum. Teaching also had a fair share in keeping me going, both financially and with respect to my personal preparation. I believe that the best way to learn and revise is to teach. I made sure to keep my sources limited, 1 book per subject so that revisions would become easy and efficient. 5) For CSAT, don’t keep cut-off as target attempt. Try to attempt all 80 questions. Mains examination is about our individuality, perspectives, analysis and uniqueness in answering. It is not about cramming up with facts, figures, stats etc. So open and wide reading and newspapers are what I would primarily recommend for mains exam preparation. Books/Study materials used for Essay Paper: None, but newspaper reading could help indirectly. Yes, I did have mock answer writing practices, but no hand notes of any kind. Newspapers, discussions and debates used to be my best source for current affairs preparation. Vision IAS compilations were also of great help. I would personally choose not to go into detail of any reports. But if aspirants are particularly interested, Economic Survey could be a good take. Pilot V5 blue ink pen, since I felt it comfortable for my speed and finger pressure. A blend of the both as and when required. But invariantly, there should be an essay style intro and conclusion to the answers. 1) It should engage the reader and remain interesting. 2) There should be a good flow. 3) Concept/undercurrent should be constant and clear without any ambiguity. 4) There should be no over-emphasizing on facts. 5) The transition from one paragraph to another and from one point to another should be very smooth and organic. 1) Factual precision and examples. 2) Unique, but reasonable ideas, if any. 3) Figures when absolutely necessary. 4) Excerpts from current affairs wherever possible. 1) Conceptual clarity in polity and remembering some important articles, amendments etc. 3) Keen awareness of international issues, India’s stands etc. 4) Knowledge of international organizations, particularly those in news. 1) Be aware on the fundamentals of economics and their implications with respect to current affairs. 2) Documents like economic survey, broad idea on Indian economic growth path, govt policies etc are necessary. 3) Keep a tab on recent advancements in S&T as well as basics in domains like space and defense. 4) For internal security and disaster management, newspaper analysis is sufficient. 2) Be conscious of what you write, do logical substantiation of the same. 3) Never go for idealized answers, the evaluators will know that it need not be genuine. 4) Case studies should be done comprehensive, exploring all options and for that sufficient time should be allocated. ClearIAS.com: What was your optional subject? 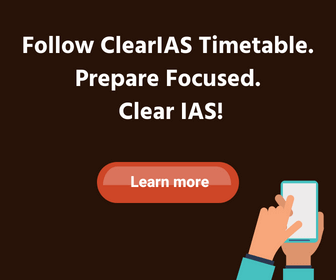 Please give our readers detailed insights on your selection and strategies regarding your optional subject. We are sure that there will be many who take the same optional subject as yours in the future. 4) availability of peer group. Mine was Malayalam literature. However, my parameter was that I should be able to do it all by myself. Retrospectively thinking, this was an incorrect parameter, making optional my weakest paper and costing me marks and a year. I believe that it would always be better to attempt the maximum number of questions. This could be done without doing any compromise, but by structuring the answers and ensuring that only things necessary are written. Additional efforts to better an answer might fetch half mark or one mark on an average. But if the same time could be used to pen down some ideas (relevant enough) for even otherwise uncomfortable questions, it might fetch more marks. And the moment a question is left unanswered, the max marks itself comes down. But this is a very personal suggestion, varying from candidate to candidate. 1) be ready for an open and engaging conversation. 2) be frank, tell “I don’t know” if that is the case. 3) never bluff, but take permission to guess, if necessary. 4) remain logical always and apologize in case of a mistake. 5) prepare a list of questions anticipated and be well prepared on the personal, academic and job-related background if any. This helped me remain confident. And yes, I attended mock interviews to work on these parameters and improve myself in the process. Hobbies included air rifle shooting, mixed martial arts etc. And extracurricular activities had music, badminton etc as a part of it. These should all be genuine and care should be taken to have a deeper knowledge in these areas. Else it would land the candidate in deep trouble. I was in 3 piece lounge suit- black blazer and trouser, sky blue shirt, red striped neck-tie and black formal shoes. The suit could be avoided by the candidate, but that should not cost him his confidence, particularly seeing all/most others in the suit. The panel which took my personality test was chaired by Air Marshal AjitBhonsle. I guess the interview lasted for about 30 minutes. 1) On my hobbies, how creating writing fits in as a hobby for a person from a technical background, explain the nuances of the working of air rifle etc. 2) From where I am coming, to which, when I answered Thiruvananthapuram, the panel asked me the major issues faced by Thiruvananthapuram as of now. One of my answers was waste management and pollution control, where I even mentioned AttukalPongala for the quantum of pollution it causes. 3) There were questions on core aerospace engineering, since it was my area of academics and corporate experience and since the panel chairman shares the interest. 4) There were quite some random factual questions, one of them being a question on the subsets of ‘Ayushman Bharat’ scheme to which I said that I did not remember. 5) There were more random questions by another member, one of which was on 3 things that Kerala could give as a message to the rest of India. Sustainable development was an answer of mine, to which I was quizzed on carbon emission of Kerala in metric tons. I said that I did not know and to this the member said smilingly that he did not know as well. 6) There were questions on women empowerment and their safety and the idea of feminism from the lone woman member of the panel. 7) There were questions based on situations, largely to test the presence of mind etc. 8) Chairman concluded the interview, revisiting the 2nd question and taking the cue from my answer, he asked what I would do to control the pollution related to Pongala if I was in charge of Thiruvananthapuram. Yes, I was happy after the interview though expectation on the mark was not very prominent. However, I did hope that it would be an above average one. 5) prepare a list of questions anticipated and be well prepared on the personal, academic and job-related background if any. This will help the candidate remain confident. However, having a good DAF has its own share of the first impression. But at the same time, it will also demand that quality to be reflected by the candidate in the interview as well. And a rich DAF automatically provides a lot of avenues for questions. But if DAF is not that strong (if the candidate feels so), s/he should put effort to provide such avenues for more questions by building up a conversation. My 1st attempt was in 2015, while I was still working. Missed prelims, primarily because I did not do my work proper with respect to current affairs. 2016 attempt was good, however, a very low score in optional left me 2 marks short of getting shortlisted. Teaching is something I have loved always and during my preparation too I developed a special liking for teaching. Hence, teaching was one thing I considered as an alternative. Dept: Product and Technology Devt Centre, Defense & Aerospace dept. Cross-check the decision based on parameters of time, necessity and priority. I don’t remember the exact marks, as I didn’t keep the screenshot of marks. The written total was 852. Got 193 for the interview. Below is the approximate marks as per my memory. I would have put more effort with respect to my optional paper. ClearIAS.com: What do you think of as the main reason for your success? Family, Teachers and Friends for sure…. I have opted for IFS and has got allocated into the same. 1) The spectrum of activity broadens with time and expertise. 2) Ever growing globalization and chaotic world order provides ample scope for activities of both national and transnational importance. 3) The possibility of a wider range of deputations in UN, IMF etc. No, except that it gave a better glimpse into the psychology of people around. It could, but it need not as well. A good educational background (not just in terms of degrees, but in terms of the quality of thought it has imparted to the candidate) can help the candidates in their preparation. A sound financial status could give more time for the candidate to dedicate for full-time preparation. But these need not be the case always, depending on the perseverance and conviction of the candidate. UPSC is a marathon, never a sprint. So take it steady, be patient, have perseverance and enjoy the process. If you are serious, the preparation itself will make you a better person. UPSC is a milestone…but road never stops at a milestone; life is indeed bigger than UPSC, never forget that. Treat life simple and logical and it should take you a long way in life.